This multi-function and highly useful Samsung-branded Qi-compatible wireless charging pad is now available with an immediate 43% discount. If you have multiple devices capable Qi wireless charging, then this is a product that definitely needs your attention. It’s quite ironic that this is a Samsung accessory being offered at a reduced price but that the modern popularity of wireless device charging is generally put down to Apple’s decision to support the Qi standard with the release of iPhone X, iPhone 8, and iPhone 8 Plus. Everyone should be well aware that Apple Inc. definitely did not invent wireless charging but its popularity and power of persuasion are so great that it immediately catapulted it into the mainstream when those aforementioned devices were released. Rather than being a single charging pad or stand, this creation can be thought of more along the lines of Apple’s AirPower offering that has yet to actually make it into the cold light of the day. It has the ability to charge more than one Qi-compatible smartphone at any given time as well as take on the challenge of breathing power into a compatible smartwatch. From a smartphone perspective, that includes Samsung’s devices, such as Samsung Galaxy S9 and Samsung Galaxy Note 9, but also includes Samsung’s smartwatches, such as the Samsung Gear S3. Of course, Apple’s 2017 and 2018 smartphones will also charge perfectly fine on this product as they are Qi-compatible. This product is Qi-certified which means that it has been proven to conform correctly to the standard and will work with all Qi-compatible devices. It also has a built-in fan and ventilation system that is designed to keep the embedded smartphone cool and safe whilst it’s charging. 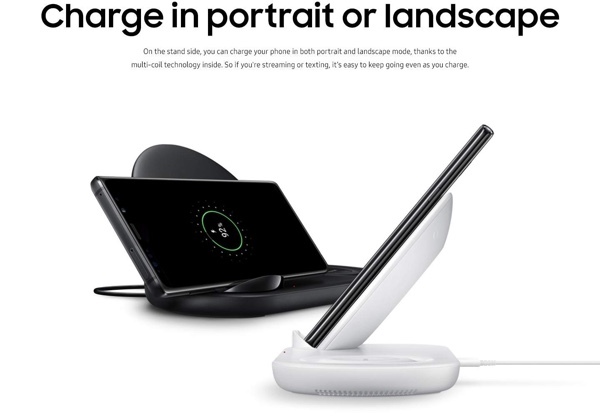 The product also supports fast charging to get power into those devices quicker than you would normally expect from a standard charging experience. If the smartphone or attached device supports it, of course! Given that hardware comes from Samsung, you pretty much know that it’s going to be solidly made and good for the money. After all, it doesn’t come with a lithium-ion battery internally so it isn’t going to explode. Grab it right now while it’s heavily discounted. It’s not a copycat cause AirPower was never released. Exactly. The writer of this article is such a Samsung hater, lol.